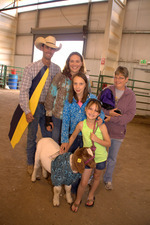 Alley Keols, 8, and Bunny Muffin, 2, made their second appearance at the Routt County Fair. Photo by Andy Kennedy. It brought together first-timers and families who’ve been sharing 4-H seemingly forever. In 1914, the first Routt County Fair drew from more than 1,100 ranches and farms around the county and festivities wrapped up just one day before that year’s first snow. The fair lasted three days and drew 2,000 people. A quarter of them arrived by train. The featured attraction wasn’t cattle or sheep or quilts, but the “Aeroplane Ascensions,” a first in the Yampa Valley and the talk of Colorado. The modern fair showcases an important piece of Routt County heritage, and in many ways, it preservesit. 4-H clubs have been involved in the fair since the late 1920s. Inspiring local youth in agriculture, early clubs were partially funded by the Moffat Tunnel League, which was promoting agriculture and business for profits along the railroad. Now there are eight 4-H clubs in the county and the participating kids’ year-long attention to animals is a major focus of this rural celebration. So is everything from rodeo to a demolition derby, quilts, canning competitions and beer tastings. Fair is a time for Routt County to reinforce its rural community connections, many of which go back for generations. “Stuck in the Old Ways” – Bringing back the old tradition to the Dress Your Animal competition, the youngest Whaley girls are showing what the Fair would have looked like in 1914. Kashley (2 yrs old) selling her goat, Baby’s milk for 15c, Addison (4 yr old) selling her eggs for 10c, and Larhae showing what it means to be a trapper, with her goat Scamper. The Whaley family has been a part of the Routt County Fair for almost 70 years. Great Grandparents Verna and Blane Whaley had their first date at the fair and were married a year later. Verna (far left) showed cattle and took prizes in cooking and sewing, and her daughter-in-law and son, Charlotte and Lynn Whaley, (in purple and checker) have been 4-H leaders for more than 30 years. 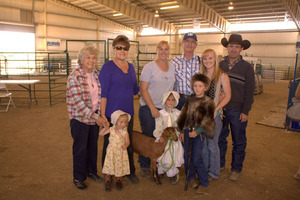 Their son, Jay Whaley, (with cowboy hat) was a Routt County Extension Agent for 12 years (during which he helped run the fair) , and Jay’s wife, Shiloh (center) says “keeping the children busy teaches them life and leadership – how to juggle many things well, how to be a contributing part of community.” And busy they are – Addison is already making cakes with Grandma. As Jalyn’s last year at the fair, this was an emotional one. The experience has led her into studying genetics and reproduction at Laramie College, with her sights on being a State Future Farmers of America Officer. 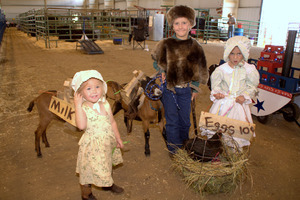 “Stuck in the Old Ways” – Bringing back the old traditions in the Dress Your Animal competition, the youngest Whaley girls are showing what the fair would have looked like in 1914: Kashley, 2, selling her goat, Baby’s milk for 15 cents; Addison, 4, is selling her eggs for 10 cents; and Larhae and her goat Scamper shows what it means to be a trapper. The Rossi family has also been around the fair for generations. Grandma Jan showed pigs and sheep in the 50s and 60s, father Tommy and mother Megan (Baker) met through 4-H, and daughters Kayla,10, and Emilie, 6, were showing cattle, sheep, goats and lambs this year. Representing another ranch of the Rossi family in the Flat Top 4-H Club is Olivia, 8, and Jessica, 17, showing their cattle. Granddaughters of Ceena and Mark Rossi, who started their 4-H club more than 50 years ago, the girls are fourth generation on the ranch, and the youngest of four girls. Michael Love, 9, is from South Routt and his rabbit took Reserve Grand Champion in his debut year at the fair, but he also entered the round robin showing someone else’s rabbit, chicken and dog. 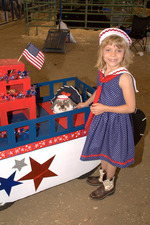 He is pictured here with Snowball, his Holland lop, in the Dress Your Animal competition. Emi and Michael look up to McKenzie Millard, 16, from Creek Ranch, who showed rabbits for her first year and lambs for her fifth. Millard’s young (pictured) Holland lops took first place and sold by the end of the day. Her bunnies also placed second in two other categories, as well as Reserve Grand Champion. Jack White and his daughter, Mary, of Clark know all about how pack animals like to stick together. Only two llamas, Otis and Hank, were supposed to come to the fair this year. But Rusty “is here because he jumped the fence,” Jack says. “He wasn’t even harnessed!” Rusty really like to be with Otis, since they usually spend their days together hiking the Zirkels with their family of 13 llamas. Mary, 18, is no stranger to the fair, having participated for a decade. She took Grand Champion for her ceramic honey pot this year, and was the Routt County Fair Queen when she was 15. From “smooth and balanced” to “functional feet,” cattle judging at the fair is a serious competition judged by JT Gillmore, a senior at Colorado State University and cattle judging pro. The queen of the cattle arena this year was Katie Parker, 18, of Yampa Valley Ranch in Soutt Routt, taking ribbon after ribbon in multiple categories including Grand Champion Breeding Beef Female, six other first place ribbons, and several second places. She had so many cattle in the arena this year that she had four friends helping her show. When talking about famous families of the Routt County Fair, one name always comes up: Long. Linda Long is the queen of the exhibition hall, directing a huge team of nearly 20 superintendents and 40 more volunteers to accept, tag, organize, show and judge the exhibits. A record 1,700 exhibits were entered for the fairs 100th anniversary. Long has been participating in the fair since 1974, and has been on the fair board since 1991. She fondly remembers growing up with the fair, surrounding by family who canned, gardened, crafted and made saddles together – “There’s no rest when it comes to the Fair,” says Long. “It’s a hard job, but it’s a fun one.” Her dream of having 100 quilts for the 100th anniversary was far exceeded, and a couple of them date back nearly as old as the fair itself – including the Whaley Quilt from 1918. 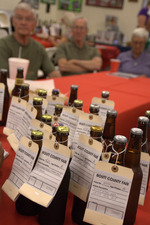 The first beer tasting in Colorado was at the Routt County Fair in 1975, creating such a love for brewing in the Yampa Valley that by 1985 more than 70 locals visited the first tasting at the Colorado State Fair in an attempt to win the grand prize. This year, local sommelier Julia Dancy judged the wines, with varieties including chokecherry, dandelion, pear, sarviceberry and even a bottle of Sangiovese.